ULYSSES, Kan.— Pioneer Electric Cooperative Helping Us Give to Society (H.U.G.S.) 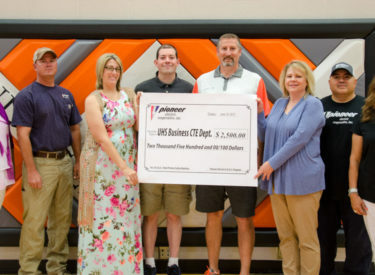 representatives presented the Ulysses High School Business CTE Department with a check for $2,500 to enhance the school’s student-run Skreened and U-Print design courses. The grant will go toward the purchase of a vinyl printer and cutting machine, as well as ink color pouches to help students get real-world business experience. The programs are designed to provide purposeful instruction while instilling meaningful content and concepts to students. Currently, students enrolled in Skreened and U-Print courses fill orders for various screen print projects. The new machines will add additional opportunities for students to hone their skills. The school then hopes to open this new service up to the public after students become accustomed to the program and anticipates that the new machines will be ready for use by the start of the fall. Additional information regarding the new machines is available by contacting the school at 620-356-1380.